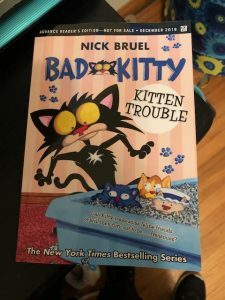 BAD KITTY: KITTEN TROUBLE by Nick Bruel is a great way to teach children about being kind! In this hilarious new book, Kitty’s family decides to foster as many displaced kittens as possible and as you can guess, she is not happy about it. Will our favorite bad-tempered friend learn to share her space, her food, and **GASP! ** her toys? Teaching young children about sharing and being kind is an important lesson in today’s world. I love how this one really gets that message across! It’s also important to teach children how to be kind to others especially those that are different from them. My son and I have been participating in kind acts for many years now from beach clean up to bringing needed items to the animal shelters or donating clothes to the homeless. Our good friend, Justin Rudd has a non-profit and he has so many wonderful opportunities for children and adults of all ages to be kind to others and make a difference. My personal favorite thing is to bring in supplies and dog and cat toys to the shelters. It’s truly important to learn to have kindness, and compassion for others. So, if you are looking for a fun way to teach your children to be kind to others, you must read this book! I would also love to hear how you teach your children how to be kind to others! Please leave a comment below! Self Disclosure: I received a free copy of this book and only feature books that I recommend.